A day out on the ocean can quickly became uncomfortable if you have not prepared by wearing the proper clothing. There are several factors to take into consideration before you start planning your outfit for the day. 1) Know the weather forecast. Check the forecast and know what type of day to plan for. While a thermal shirt and windbreaker might be perfect for a cool, breezy day, it will be very uncomfortable on a hot summer afternoon. Find out ahead of time if you are going to need wind or chill protection for your day. If it is looking like a wet or rainy day, consider wearing a wetsuit. 2) Don’t wear cotton. Cotton absorbs water and stays wet, making for a cold and uncomfortable day on the water. Even if you never flip your kayak, you will get wet from splash, spray and drips. If you are in a sit-on-top kayak you will be sitting in some water, so cotton pants will quickly become soaked and cold. Instead of cotton, wear synthetic materials such as polyester, fleece or Gore-Tex. This means you shouldn’t show up for your kayak trip in jeans and a cotton T-shirt, unless you like being cold and wet. 3) Dress in layers. Your outer layer should help you stay dry. A good paddle jacket is a water resistant, breathable layer that should fit snuggly and help keep you dry. If you are going on an Adventure Company trip, we will provide you with a light weight paddle jacket to use for the day. Under your paddle jacket, you should have a few synthetic layers so you can easily peel out of clothing if the weather gets warm. 4) Wear shoes that will stay on your feet. 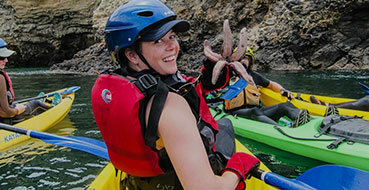 A water bootie or water shoe is the ideal choice for kayaking. They will stay on your feet, keep out the rocks, and your feet will stay warm while kayaking. Water sandals with proper straps are also a good option, though you might have chilly feet if the weather is cool. Flip flops are not recommended, as they tend to easily come off your feet in the water and the soles are often slippery. 6) Pack a change of clothes. At the end of your kayak trip, chances are you are going to be wet. So pack a towel to dry yourself off and a comfortable change of clothes for your journey home. Lastly, wear your biggest smile. It helps make every experience better!